Please click for Haskell's Alert!!! Click here to download "In My Life"
Heavy trucks rumble over a badly scarred landscape. As if to imitate the railroad tracks that lie just north of it, a one-mile long access road snakes its way across the upper boundary of the property. Two substantial bridges have been constructed; one over Bell Canyon and another over Tecolote Creek. The bridges will be used to carry building materials for construction of a 400-room destination resort in the event that financing for the 200 million Santa Barbara Club Resort & Spa can be found. The monarch butterfly roost on Tecolote Creek is gone now, a victim of development.The County pretended that it was powerless to do anything about it. Hundreds of mature trees have been destroyed. The ground has been scrapped and mauled and raped. Veronica Lanz said that it doesn't look like good old Haskell's Beach anymore. It certainly doesn't look like the Haskell's Beach that local artist Marsha Burtt painted. 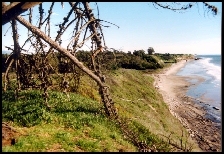 Her painting, "A Day at the Beach", depicts soft shrubbery and the trail leading to Haskell's Beach from the parking area located near HWY 101. Access to the trail is cut off now, and the soft shrubbery has been replaced by scarred and chopped earth. Bob Keats was sick when Hyatt Hotel Corporation decided that it wanted to build a giant resort at Haskell's Beach. All was not lost as Citizens for Goleta Valley was actively waging war against the project. The opposition stopped, however, when exhausted from a series of lawsuits, Citizens for Goleta Valley agreed to accept five millions dollars as mitigation in exchange for a promise to end their resistance to the project. In the summer of 1991, Keats, battling recurrent illness, began making phone calls in an attempt to find an organization willing to take up the slack. In June of 1991, world famous big wave surfer, Fred Van Dyke suggested the Bob take his concerns to the Surfrider Foundation. In January of 1992, the first meeting of the Santa Barbara Chapter of the Surfrider Foundation was held at a coffee shop in Isle Vista. The Surfrider Haskell's/Naples Task Force was founded in April of that year. 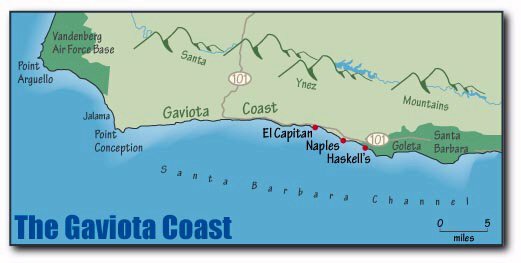 Since it's founding, the Haskell's/Naples Task Force has fought to preserve the Gaviota Coast from what it believes to be inappropriate development. The group believes that development at Haskell's Beach, and the adjacent ARCO property could lead to the urbanization of the entire Gaviota Coast. The massive resort planned for Haskell's Beach is seen as a gateway project. Haskell's Beach natural beauty and resources have been prized for centuries. Substantial Chumash Indian remains dot the site. In modern times, Haskell's Beach has played host to those seeking solitude, recreation and a nature experience. The site has been used for a variety of other purposes, including a prominent Native American Chumash Village, kelp processing, crude oil storage, oil extraction, and agriculture. Nature has created a natural amphitheater at Haskell's Beach. Bisected by Tecolote Creek, Haskell's Beach, is defined by its gently sloping Central Valley, which extends from the top of the property to the sea. Two marine terraces rising nearly 100 feet flank the valley. Steep cliffs up to 95 feet with slopes up to 100% define much of the southern boundary line. The site included a number of outstanding natural features including a brackish marsh, and a low-coastal dune system. Several local, state and federally listed, protected or endangered species have been observed on site, and in areas within the vicinity of the site. These include the Monarch Butterfly, the Southwestern Pond Turtle, the California Red-Legged Frog, the Coast Horned lizard, the Tidewater Goby, the Greenbacked Heron, the Western Snowy Plover, and the white-tailed Kite. Despite our best efforts, Haskell's Beach fate is hanging by a thread. All that remains is for the developers to find sufficient financing for their project. Can Haskell's Beach be saved? Can it be restored to its former beauty if it were to be saved? These are questions that only time can answer. A tragedy of great magnitude is occurring at Haskell's Beach. A serious methane gas leak and discovery of additional Chumash artifacts has held up development of the proposed Santa Barbara Club Resort & Spa at Haskell's Beach. The Coastal Development Permit for the project will have to be revised in order to accommodate changes in the development plan. "UH-OH,WHAT'S THAT SMELL? Discovery of a methane gas seep has halted work on the Santa Barbara Club Resort and Spa at Haskell's beach but is not considered serious enough to derail the massive project. Flammable and explosive levels of the gas were found about four feet below the surface on the western terrace, where one of the resort's three restaurants is planned. Owners knew the gas was there, just not how much. "It is a natural seep that is perpetual," said spokesman John Tynan. "We pumped it before and vented it before, and it keeps coming back." Tynan said the site will not be abandoned. An expert must design it so the restaurant can be situated there and plan construction so it can be done safely by workers. While this is causing minor delays, last winter's El Nino storms really threw the project off its time line, pushing back the opening date from January 1 to May 2000." Developers have completed Phase I of the massive Santa Barbara Club Resort & Spa hotel project. Phase I included construction of the access road, Tecolote Creek & Bell Canyon Bridges, and installation of retaining walls. Developers are hoping that financing for the massive project will arrive in time for Phase II which entails construction of the hotel itself. Earlier this year, representatives for ADCO Group of New York, which owns the 73 acre property, reported that construction is imminent since the investment firm of Salomon Smith Barney had signed a commitment letter for a $112 million long-term loan. As disturbing as the report is, it is important to remember that the resort has not, to the best of my knowledge, finalized a financing package. The resort has several negative features that have thus far made potential investors exceptionally wary. While residents await Tynan Group's next move, much of Haskell's Beach natural habitat has been devastated by the massive grading permitted in Phase I of the project. Undisturbed by public concerns over ham-handed development techniques, which include the destruction of hundreds of mature trees, and reaching what the United States Fish and Wildlife Department refer to as a "maximum take" for an endangered species (according to a reputable source, 10 rare Red-Legged Frogs have been destroyed), Tynan Group (representative for ADCO GROUP of New York, the project owner) worked feverishly to fulfill several conditions that were required to be met prior to the issuance of a Land Use Permit (LUP) for Phase II of the project. These efforts prompted at least one prominent on-site monitor to describe the site as "out of control", and to characterize the SBCR&Spa's on-site representatives as "contentious". On Friday, December 5th, 1997, despite several outstanding issues, the County of Santa Barbara issued a "Notice of Final Approval/Issuance of a Land Use Permit for Phase II of the Santa Barbara Club Resort and Spa project which includes construction and operation of the resort hotel and associated improvements as shown on the Planning Commission Exhibit dated September 4, 1996." According to the Conditions of Approval, SBCR&Spa's permit for Phase II will expire on December 5,1998, unless substantial physical construction is completed. In 1976 the California Coastal Commission recommended that Haskell's Beach be purchased for public recreation. Between 1977 and 1979 the State Legislature appropriated $2.3 million dollars to be used by the California Department of Parks and Recreation to acquire a portion of the site for recreational purposes. The proposed purchase was abandoned in 1980 die to the owner's unwillingness to sell at the appraised value. The Gaviota Coast represents the last significant stretch of relatively undeveloped, unprotected coastal land of this magnitude remaining in Southern California. Haskell's Beach forms one of the most beautiful segments of that coast. In the mauling of Haskell's Beach are we perhaps witnessing the beginning of the end for Santa Barbara County's beautiful undeveloped landscapes. With the development of Haskell's Beach we all stand to lose a little piece of our own souls to a crass commercial world that places money, as it's highest ambition. Haskell's Beach is located on the south side of U.S. Highway 101 and the Southern Pacific Railroad tracks, approximately 1-mile west of Winchester Canyon Road. The site is bounded on the east by Bell Creek. The western boundary is defined by a row of trees bordering an adjacent rural parcel. Nature has created a natural amphitheater at Haskell's Beach. Bisected by Tecolote Creek, the 73 acre site is largely defined by it's gently sloping central valley which extends from the top of the property to the sea. Two marine terraces rising nearly 100 feet flank the valley. Steep cliffs up to 95 feet with slopes up to 100% define much of the southern boundary line. Haskell's Beach also features a brackish marsh, a low-coastal dune system, and a Monarch butterfly roost, which has recently been destroyed by developers. Several local, state and federally listed, protected or endangered species have been observed onsite, and in areas within the vicinity of the site. These include the Monarch Butterfly, the Southwestern Pond Turtle, the California Red-Legged Frog, the Coast Horned Lizard, the Tidewater Goby, the Greenbacked Heron, the Western Snowy Plover, and the white-tailed Kite. The site has been used for a variety of purposes, including a prominent Native American Chumash village, kelp processing, crude oil storage, oil extraction, agriculture and recreation. In 1969 Wallover Corporation purchased the site as part of a 1143 acre holding in Tecolote Canyon. In 1975 a proposal to build 153 clustered town houses on the site was denied by the County of Santa Barbara based on inconsistencies with the County's proposed Local Coastal Plan (LCP). In 1976, the California Coastal Commission recommended that Haskell's Beach be purchased for public recreation, and zoned 1-A. Between 1977 and 1979 the State legislature appropriated $2.3 million dollars to be used by the California Department of Parks and Recreation to acquire a portion of the site for recreational purposes. The proposed purchase was abandoned in 1980 due to the owner's unwillingness to sell at the appraised value. In 1983, Wallover Inc. and the Hyatt Corporation jointly filed an application with the County for a preliminary Development Plan and a rezone seeking approval of a 524 room destination resort. Despite the fact that the County Planning Commission denied the project in October of 1984, the request was heard on appeal and approved by the County Board of Supervisors in May of 1985. In July of 1985, the County resubmitted the Local Coastal Plan to the California Coastal Commission for certification. In its resubmittal, the County proposed redesignating Haskell's beach 'Visitor Serving Commercial' and inclusion of the site into the Goleta urban planning area. Art Florez, general manager of Pacifica Suites in Goleta, commenting on SBCR&Spa's high priced rooms/ slated to rent for $300 to $400 dollars a night, stated, "'That's going to be almost impossible' to rent the rooms. The resort will have little, if any impact on rivals." Newspress/ December 12, 1997. Isolated, flanked by two oil facilities, one of which creates odors akin to rotten eggs, fronted by cold water, and plagued by globs of tar resulting from oil seepage, it is a wonder that anyone would want to build a resort on this site. While cold water and tar does little to deter surfers, will visitors to Santa Barbara really be interested in paying hundreds of dollars a night to sleep near an oil pier whose concrete pylons stand in 55 degree water? How do you like my page? Click here for email!